Mercury has bumped up its supercharged Verado from a top rating of 275- to 300-hp. No big surprise, the new Verado 300 is a natural extension of Mercury’s existing line of In-Line-6 cylinder motors. In order to build that lofty level of horsepower, the new Verado requires hi octane gasoline. In a jam it could burn 87 octane, but with its horsepower electronically dialed back to prevent piston damage. Digital throttle and shift are part of the package. Also new is a 200-hp Mercury Verado able to survive saltwater and expressly built to power bay and flats boats as well as twin-engine offshore boats. The real eyebrow raiser here is the fact that it’s an Inline four-cylinder motor, a pipsqueak compared to its worthy competitors. You probably already knew that Mercury already builds a 200-hp inline six boasting more displacement. Packing this much hp into such a diminutive package Inline 4-cylinder block that burns 87 octane fuel (as opposed to premium) is a laudable accomplishment. 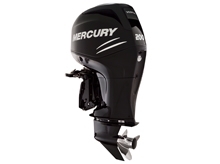 According to Mercury spokesmen, midrange acceleration has been programmed to exceed any other outboard in the world. That means enough torque to hold a heavy boat on plane at slower speeds, a vitally important characteristic when offshore and climbing tall waves. Key features include a two-stage intake resonator and idle relief muffler. That and the high performance acoustic foam lining in the cowling squelch sound levels to the point where at speed wind and water noise are louder then the engine.